New York, a state which has seen its Amish population explode in recent years, is also home to numerous Amish shed dealers. Residents of Buffalo, Rochester, Albany, Long Island, Syracuse, Ithaca, NYC, and other areas can locate a seller of Amish-built structures within an easy drive. Wooden and vinyl Amish sheds come in numerous varieties and styles, including Victorian, A-frame, Cape Cod, Cottage, Quaker, and more. These storage buildings can often be crafted to customer specifications, with a variety of options to choose from. Use the guide below to find an outlet near you. Homestead Designs provides a broad selection of hand-built sheds available in several different styles, such as A-frame, Quaker, Barn, Hip Roofs, Garden Belles, Victorian, and more, including custom designs. Each piece is made from the finest materials by skilled Amish woodworkers, contributing to the sheds’ durability. Wooden Amish sheds come in hemlock or pine construction, with steel roof or shingles options. Concord Amish Village carries vinyl sheds, wood sheds, and cedar & hemlock sheds. A broad choice of styles and designs is available with a full line of options to allow them to be customized to any specifications. Shed Man Custom Woodworks offers an extensive choice of Amish-built sheds, available in a range of styles such as Garden, Quaker, Victorian, Dutch, Cape, A-frame, or Carriage. Shed Man’s Amish crafted storage buildings come in a full line of options giving the customer control over windows, flooring, siding, roofing line, and color. Each piece of their products is made from high-quality materials (wood & vinyl). 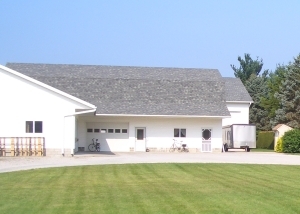 Fred’s Sheds LLC features Amish custom-built sheds among different manufacturers. Sheds are available in a vast array of styles including Gable, Gambrel or Saltbox. Fred’s works with Amish craftsmen who use top materials and take special care over detail, resulting in a shed that’s built to last. Amish wooden sheds built using rough-sawn, kiln-dried pine. A variety of window and paint color options available as well. Plus Ten Buildings offers garden sheds, Quaker sheds, and Victorian style sheds among different products made both by Amish and non-Amish woodworkers. Plus Ten’s Amish made sheds come in a variety of options such as paint or vinyl, wood choice, roof, windows and floor options. Grammy’s Country Corner sheds come in a range of common styles customizable to a variety of options such as different vinyl, trim, shingles or shutter colors. Door and window options also available. An extensive selection of hand-built sheds available in a vast array of options such as flower boxes, weather vanes, shutters, cupolas and more. Amish Craft Barn delivers sheds assembled, and also builds sheds on site (prospective shed area must meet certain conditions). Amish Outlet & Gift Shop features a broad choice of storage sheds. Stocking over 50 storage buildings throughout the year. Amish Woodworks carries a broad choice of Amish-made outdoor building including sheds, barns, garages, swing sets, playhouses, or lighthouses. Sheds come in a range of options, styles and types. Amish Made Sheds Gazebos features a vast array of Amish-handcrafted products including sheds, gazebos, play sets or playhouses, cabins, horse barns, chicken condos and more. Amish-made sheds come in various styles and options such as Peak, Mini-barn, & Dutch barn styles, as well as Cottage, Hip, Cape Cod, Victorian, Providence Carriage and more. Each style has its own different options including windows, door, floor or roof. You can also make your own choice of materials according to your preferences. Thee Amish Structures provides an extensive selection of Amish-made storage sheds, available in multiple styles including Garden, Mini-barn, A-frame, Dutch barn, Standard Quaker, Deluxe Quaker and more, perfect for yard tools, equipment and other outdoor items. Each style has its own options ranging from windows and roof to paint colors, as well as vinyl or wood material (duratemp siding). Amish-crafted sheds can be made to order to fit customer needs. Delivery free within 50 miles; also does on-site shed builds. The Amish Barn Company provides a variety of outdoor structures including sheds, garages, gazebos, barns and play houses. Their durable Amish-crafted sheds come in a wide selection of common styles and options. Brad’s Barns & Gazebos provides various styles of hand-crafted Amish sheds made from high-quality materials such as vinyl, cedar, duratemp, log, pine or pine board & batten. The Barn Raiser carries an extensive selection of Amish-built outdoor structures including sheds, available in common styles. Each product can be made to order to fit customer specs. Slate Hill Storage provides a nice choice of sheds in various styles including Cape Cod, Salt Box, Quaker, Gable Porch and Barns. Amish sheds available with different accessories. Also sells log cabins, horse barns, gazebos, swing sets and play sets, outdoor furniture, and other products. Foote’s sells Amish-made wood sheds, vinyl sheds, and board & batten sheds in styles including the A-Frame, Colonial, Dutch, Dutch Classic, Quaker Mansion, and more. Also sells gazebos, playhouses, dog kennels, and a range of garages (single or double, in wood or vinyl). New York residents: Please verify hours of operation of Amish shed sellers given here. Business locations and opening hours can change. As a rule, Amish-owned businesses will be closed on Sundays given Amish beliefs about the Sabbath. Non-Amish shed dealers may be open. Not responsible for any changes to the above information, though we seek to keep it up-to-date. The Empire State has become a popular destination for Amish in recent times. Lured by relatively inexpensive farmland (compared to prices in more heavily-settled states like Ohio and Pennsylvania) Amish have flocked to New York, founding new communities and joining already-established ones. Significant Amish communities can be found in New York in the Conewango Valley, Mohawk Valley, Heuvelton (Canada border) area, Clymer (Chautauqua County), and numerous other locations throughout the state (read more on the Amish of New York). In addition to the traditional farming vocation, many Empire State Amish have also opened cottage businesses, operating out of their homes and farmsteads. Manufacturing is a key part of this burgeoning Amish business sector. Furniture, cabinets, carpentry, and handicrafts factor large in the Amish economy (more on Amish furniture in NY). Building sheds and storage buildings is another popular business for the Amish. The Amish firm is typically a small one, oriented around the home and family. An Amish woodworking or shed-building business may have just a few employees, or primarily employ family members (sons, daughters, and wives get in on the act in some cases). Amish emphasize cost control, efficiency, simplicity, hard work, and quality products. These key values, inseparable from Amish culture, have contributed to the positive reputation of Amish-made sheds and storage buildings. The guide above gives numerous options for retailers of Amish sheds. Most are not Amish-owned; however they maintain partnerships with Amish producers, who build sheds at their home businesses for retail sale via the dealers. Given the significant New York Amish population, and the popularity of Amish-built storage buildings, you are never very far from an Amish shed seller in the Empire State. Amish shed dealers provide convenience by being located near major cities and carrying large amounts of product which can be viewed and tested on-site. Additionally Amish shed dealers can help to arrange custom orders so that you can design a shed to your specific preferences. Alternatively, some Amish shed buyers prefer to visit the source. While many Amish woodworkers and craftsmen prefer to sell their products wholesale only, there are a number who specialize in direct retail sales to the public. These may be found both in New York and in neighboring states such as Pennsylvania. Visiting an Amish home business is an experience in and of itself and may appeal to those who don’t mind going on the road and spending a little more time in pursuit of their Amish shed. Finally, online ordering of Amish sheds is another popular option. Theoretically this is the most convenient of all, as you can customize and order your shed from the comfort of your home using only your computer. Web-based Amish shed sellers also often offer delivery, bringing the shed and installing it in the proper place in your backyard. The internet Amish shed option is the lowest-hassle, though it does have the drawback of not allowing you to “field-test” your shed, as you would be able to do at a shed dealer. I am interested in a 10 X 20 shed I need to talk to someone for information as to what is available including installation. looking to see if you move shed from one home to another shed is 12×16 14 foot high.